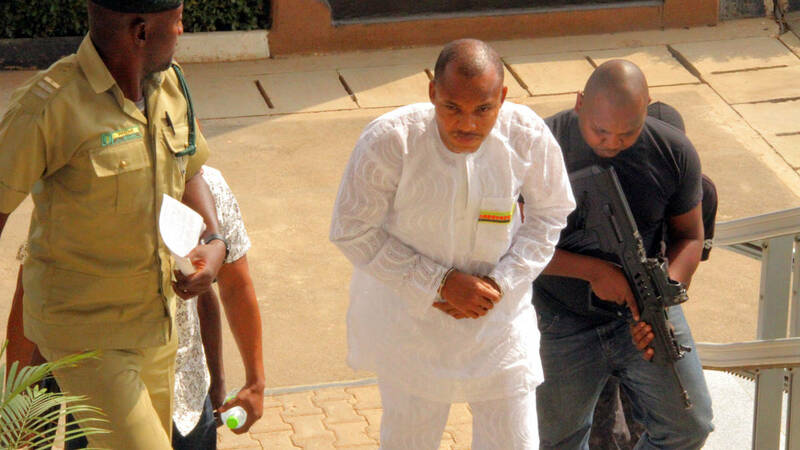 Prince Nnamdi Kanu the leader Of Indigenous People of Biafra and the Director of Radio Biafra is expected to appear in court today the 5th of April 2016 as scheduled by the Chief Justice John Tsoho of the Federal High court. On the 9th of March 2016, Nnamdi Kanu's trial stalled as Justice Tsoho adjourned his trial after the Defence council to Nnamdi Kanu led by Chuks Muoma(SAN) informed the court that he at the request of the defendant had filed a motion for stay of proceedings having been unsatisfied with the previous court rulings which include among others- bail denial and allowing for masquerades to testify against him in the same court that ruled against secret trial. After hearing from the Prosecuting council led by M.S Diri who confirmed receiving a notice from the Defence council and also prayed for the court to adjourn the case so as to allow him time to analyse the notice, the court had to adjourn the case to 5th of April being today. Meanwhile pressures are mounting heavily on Justice John Tsoho to honourably step down from the case with accusations coming from different quarters that he lacks the integrity to handle such high profile fragile case. The South-East Based Coalition of Human Rights had earlier in one of its press release accused Justice Tsoho of being desperate to become the next Chief Justice of the Federation, a position approved by the office of the President which has severely influenced his rulings against Nnamdi Kanu and in favour of the Federal Government including- bail denial, confiscation of private properties by DSS and his recent subversion of natural justice by ruling in favour of masked witnesses against Nnamdi Kanu although he had earlier ruled against secret trial. The Indigenous People Of Biafra have also left no stone unturned in condemning Justice Tsoho questionable rulings, accusing him of bribery scandal with the FG which has led him into murdering justice. Several Human Rights activists and Rights Groups in Nigeria and the international communities has also condemned Justice Tsoho's ruling for masked witnesses to testify against Nnamdi Kanu saying such ruling is highly undemocratic and an abuse of rule of law. Having faced all these criticisms and allegations, including Nnamdi Kanu's request for a change of a trial judge in his appeal to the upper court having lost confidence in Justice Tsoho, it is widely expected the Justice John Tsoho will do himself a whole lot of good by stepping down honourably today from this case that seems to have dragged his integrity and that of Nigerian judiciary to the mud. Buhari and his agents will be jailed for life because of Nnamdi Kanu. This dimwit of a justice I the person of John Tsoho or Tozo whatever he calls himself is further exposing porousity and vulnerability in the Contraption fraudulent geographical and devilish fredrick lugard amalgamation. The Zoo is obvious unupright.